"There is no such thing as a “perfect” parent, so just be a “real” one." Are you a parent? If so, you are in luck because I have some excellent tips on how to handle unsolicited parenting advice. Truth-be-told, almost everyone has an opinion on how to raise children. Some advice is helpful, but others can be downright offensive. It can be hard to stay positive with everyone throwing their form of parenting your way, but, thankfully, it is possible. The next time someone gives you unsolicited advice on parenting, do not throw a shoe at the person, rather keep your cool, stay positive, and “brush it off your shoulders” – that is if you don’t think the suggestions will work for you. But, at the same time, it doesn’t hurt to listen to other people’s advice – if it won’t work for you simply discard it. The worst thing you can do, however, when people bombard you with unsolicited parenting advice is to become loud, abusive, and/or offended. Do not attack the person giving you the advice, because it will only make the situation worse, or possibly, damage your relationship with him or her. Rather, simply thank the person for the advice, and move on. In other words, use what you can, and discard the rest. Another good way to positively handle unsolicited parenting advice is to “do what is right for you.” In other words, do not follow trends, follow your gut. As mentioned above, you know your child, and you know what works for that child, therefore, you are the expert in this matter. However, as also mentioned above, it is ok to adopt other parenting practices. In other words, it is ok to take helpful advice from others, even if you did not ask for it. Most, if not all parents (to some degree), want to be the “best” parents they can be for their child, so why not learn new and better ways to parent him or her. What is the harm in trying some of the suggestions? As long as the advice is not abusive or neglectful, why not give it a closer look. What would it hurt? If you try it, and it is ineffective, don’t do it anymore. But, ultimately, how you parent your child is your choice. If something does not feel right – don’t do it. And, if something works for you – keep it! Keeping an open mind may be extremely difficult, for you, but it is important, if you want to handle unsolicited parenting advice with a positive attitude. Truth-be-told, almost all parents believe that they are an expert on their child’s behaviors, personality, thought processes, etc., and to a certain extent that is true, but sometimes, just sometimes, it is helpful to receive advice from people, who have raised children, and those, who are currently raising children – not because you are a “bad” or ineffectual parent, but simply because they may have a tidbit more information than you. For instance, maybe your neighbor, who has a child around your child’s age, found a new way to potty train toddlers, while perusing a parenting magazine at her doctor’s office. Your neighbor shares what she found with you, not because she thinks that you do not know how to potty train your child, but simply because she thinks the information will be helpful to both of you during potty training time. As hard as this may be to hear, sometimes parents do not know everything. On the other hand, sometimes, what works for one parent may not work for another. 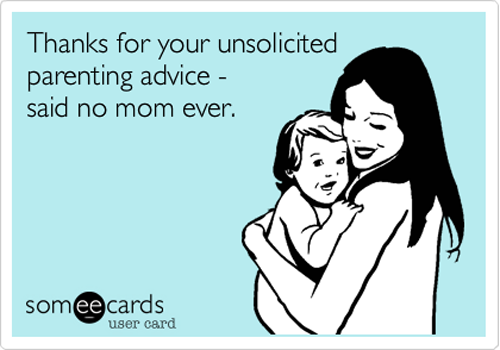 Therefore, keep an open mind when someone gives you unsolicited advice – it may just make you an even better parent then you already are! Lastly, handle unsolicited parenting advice by trusting your instincts. In other words, go with your gut feeling. If someone offers you unsolicited advice, listen to them, and if it doesn’t feel right to you, dismiss it. Many parents second-guess themselves when it comes to their children. You want to be the “best” parent you can be, and you want to do everything just “right.” Hate to break it to you, but you are not “perfect,” and you will make mistakes, while parenting your child. You are human, and it is normal to “mess up” sometimes. The key to successful parenting is to trust your instincts, acknowledge your mistakes, and learn them. Do not, however, dismiss or ignore that little voice in your head that screams “This is wrong. This is wrong. This is wrong.” Why? Because, it can cause you to miss signs or make even more parenting mistakes. For instance, you have a sneaky suspicion that your child may be allergic to formula (your baby has severe allergies), but your best friend tells you that it worked wonders for her baby, so you try it will you allergy-prone baby and she gets sick. You did not go with your gut feelings, which caused your baby to get extremely sick. You could have avoided this situation, if you had trusted your instincts. Therefore, it is imperative that you go with your instincts. Why? Well, because they are trying to tell you something very important.